So after a few months of pondering, researching, baking up madness in the kitchen and contending with a house move, I've made the call to start a baking blog. I've blogged before, when I was self employed, but never really understood the whole concept of blogging, until I got involved in work project and thought "I could do this for myself!" So here were are. Welcome to What Claire Baked. 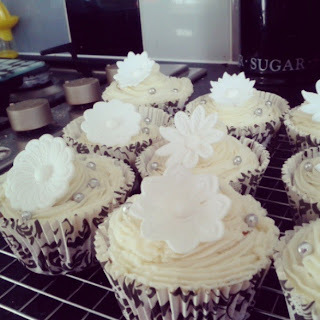 I'll aim to post as often as I can and keep you up to date on my latest baking exploits. I know it's soooooooo 2012, but cupcakes are kind of my thing. I've tried to get over my love for these tasty little cases of gorgeousness, but I just can't. I'm sorry. My love affair started at the Magnolia Bakery in New York in 2009, during the Carrie years, and it's never left me. I also enjoy making the odd birthday cake and I plan to challenge myself to make new and challenging bakes in the future. I'll keep you all posted on the challenges which lie ahead and the difficult questions that I face daily... Sugarpaste or fondant flowers? !